Panasonic’s AG-UX180 allows for 4K 24p, UHD 60p/50p, FHD 60p/50p multi-format recording and HD super slow-motion. Its two SD memory card slots enable the potential for backup recording delivering enhanced reliability and also supporting UHD/FHD dual codec recording for a more effective workflow. 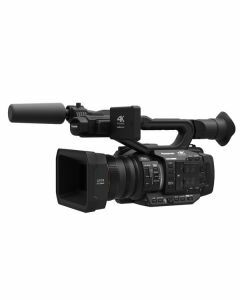 The controls of the AG-UX180, like its manual three rings and user button, and interfaces, including 3G-SDI/HDMI and XLR inputs, are designed to surpass the expectations of professional video recording. Delivering the better levels of versatility and sturdiness as a conventional HD handheld camcorder, the AG-UX180 offers potent support for high-image-quality 4K video production.